We carry a variety of Gowns for the Middle Ages. Gowns and Cotehardies can be the basis of many different medieval outfits. Typically a "male" outfit, it can be worn by men or women. Here we offer these Medieval or Renaissance gown in a wide variety of color choices. Medieval Surcoat and Chaperon Hat with dagging at the hems of the Chaperon (hat), Sleeves and Surcoat hem. Early 15th century design. Our Medieval Custom Gown comes with three quarter length sleeves and is calf length. This very basic garment was worn throughout the Middle Ages and can be the basis of many different medieval outfits. Medieval Monk's Robe and Hood includes the Cowl and Hood. Made from Linen. Our Medieval Houppelande and Hood Set is styled after a 1360’s Houppelande and includes the Medieval Hood with dagged shoulder cape. The outer sleeves have contrasting dagging. 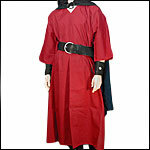 Our Medieval Gown Plain, comes with three quarter length sleeves and is calf length. We offer this gown in a wide variety of color choices. Typically a "male" outfit, it can be worn by men or women! The Nobles Robe is for the man with too warm of heart. Front laces add versatility as it can be worn laced or unlaced. We recommend wearing the Nobles Robe with the Classic Renaissance Shirt, Hosen or Breeches, Ring Belt, Arm Bracers and our Cavalier Hat.